As long as utensils are kept clean and ingredients are fresh and of the highest quality, rinsing kefir grains is not necessary. Rinsing kefir grains came about after the mother-culture including kefir were introduced to the rest of the world. It came about in recent years, possibly due to concerns regarding weed microorganisms settling on the grains. The robust nature and properties of the microflora, and possibly the physics behind the grains themselves, are effective inhibitors or can antagonize the growth of weed organisms. I am able to exploit this very nature of kefir, by implementing kefir as a natural preservative for preserving fresh foods in solutions containing as little as 10% kefir or kefir-whey, with exceptionally good results. It is so much easier to serve a nice meal to guests when you have it budgeted in, instead of skimping it in with your food budget. I found that I could be more generous and serve my best when I set a monthly amount set aside for hospitality. Now I include in hospitality: bringing a meal to someone in need and church shared meals, due to the fact that I am making over and above the amount that would just feed my family. This tip I gleaned from Rachael Crabb’s book, The Personal Touch. (This book appears to be out of print, but is available used) She recommends having a simple meal always on hand for those last minute or impromptu occasions. I usually stash a pack of chocolate chips in the cupboard so I could quickly make a batch of homemade cookies. I also like to keep pizza toppings on hand. I make a batch of four pizza crusts at a time and freeze them in addition to a big batch of spaghetti sauce that I freeze in small zip block bags. I can easily pull one or two out as needed. You could also use store bought crusts and have a can of spaghetti sauce on hand and be creative with the toppings. Aaron loves pizza, so his favorite toppings include cheese, pepperoni, sausage, green peppers, olives, etc. I will post my recipe in an upcoming post. You could also just have a frozen meal stashed away in the freezer. 3. Pray before they come! Relax yourself by asking the Lord to bless your fellowship, that your guests might be refreshed and encouraged and that everything would flow smoothly. I always love to hear how a couple met and especially how they came to know the Lord (if they are believers). - Where is the Lord leading your family? - What is your favorite book of the Bible? -What has the Lord been teaching you over this past year? -Tell us about your family, where you grew up, etc. -What brought you to live in this area? -What has been the most important experience in your life? -Who has been the most important person in your life and why? Aaron and I have tried to start the habit of blessing our guests by praying for them before they leave our home. We ask them of any prayer needs they may have or just pray a blessing over their family. We have found this to be a sweet way to wrap up our time together. To read point 1 of this series, click here. The church was devoted to corporate fellowship with fellow believers in worship and communion with one another. Attending church was a priority for them. Together the church is for the purpose of the edification of the body – we are to challenge and encourage one another in the Lord. If we are not continuing to fellowship with other believers we are more susceptible to straying from the truth and sound doctrine. We must not separate ourselves from believers! How often do I ask, “how are you really doing?” I need to get beyond the “hello” and “how are you’s” to asking good questions: what is God doing in your life? How can I pray for you? This is not only a blessing to them but also to me! Ten Questions for the New Year is a list of wonderful questions that I have found very effective at any time. Am I making a regular habit of welcoming fellow believers into my home? It seems like fellowship at church can be somewhat limiting at times, so having people into my home can serve to lead in much more lengthy and beneficial conversations. Hospitality is such a blessing and gift to others. Enjoying a warm meal together is not that common anymore in our day and age. In the last 25 years, having friends over to your home is down 45 percent (according to Harvard professor Robert Putnam). Let’s change the tide and seek to bless others! It doesn’t have to be complicated. The fact that you extended an invitation is a blessing enough. Don’t limit yourself because you might not have the gift, or be able to creative amazing meals, or have a perfectly clean home. God will bless your efforts if you seek to be used of Him to minister from your home. Attending church regularly, having hospitality in your home, seeking to lead in profitable and edifying conversations…these are tools to edify the saints and to guard against straying from the truth. I have been studying the book of Acts lately, and I have been struck by the emphasis on the growth of the early church and how it labored together resulting in a flourishing movement of Christ throughout Jerusalem, Judea, and Samaria. How was this taking place? How were they living out the gospel in their lives? Five things that I highlighted above stood out to me that I was mediating upon this passage. How can we walk in the example of the early Christians? The early Christians listened diligently and heeded the teaching of the Scriptures. They were eager to grow in their understanding of the truth. They applied their hearts to it, seeking to apply its truth into their own lives. They did not limit the hearing of the Word to one day a week, but the church was flourishing because they daily were dwelling in the Word and hearing it. How can we apply this today within our own homes as wives and mothers? The feeding and nourishing of our souls is of first importance as we plan each day. Being a wife and mother can be a weighty and challenging task. Skipping out on your devotions because of your lengthy list of “to-do’s” for the day is not the answer. Sitting with Mary at the feet of Jesus is the key to be renewed in our minds and be strengthened to fulfill the duties of the day. Martha was distracted and busy with other things, although they were important, they can come after sitting at Jesus’ feet. Whether it be for 5 minutes or 30 minutes…the fact that you take that purposeful time to spend in the Word, the smoother and more effective you will be throughout your day. Fill up your tank daily! Resource: I have found this Bible reading plan an excellent resource for just encouraging you to read for 5 minutes, 1 chapter a day and get through the whole New Testament in a year. Check it out here. This does not of course have to limit you…but if you are lacking in this discipline, it might help give you a little plan to get started. I have found it so beneficial to listen to a sermon a day while I do my kitchen cleanup, dinner preparations, housecleaning, etc. Now it doesn’t always fit in so easily, but that is my goal. I have subscribed to a few different sermon podcasts through i-tunes, such as sermons from Covenant Life Church, Desiring God, Mars Hill Church. Each week they come out with a new sermon that uploads to my podcast section. I can either download these to my i-pod (which is currently under the weather ;( ) , or I just listen from my computer. I love it! It is so edifying to my soul. It’s like I am daily filling myself with the apostles’ teaching, just in a more contemporary manner. Previous to getting married, my future mother-in-law first started to try to win me over to the kefir user crowd, and I thought, “I am not that crazy of a health-nut! I will never use that stuff…” Low and behold it wasn’t long before I thought I would give it a try. Maybe it was to impress her, I don’t know. Now I am an avid supporter and user of kefir in almost anything. If you are asking, what in the world is kefir? Read more about it here. If you already know, read on. 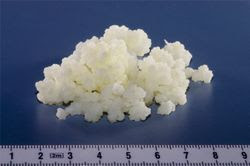 To the left you will see a picture of a kefir grain. Here are a few ideas of how I use kefir on a regular basis. First off, morning smoothies! I love loading up my morning smoothie packed with nutrients. It is very reasonable to make, simple, and will give you lots of energy for the day! I try to make a smoothie at least once every other day. Another thing I use my kefir for on a regular basis is soaking my grains. Soaking is encouraged because it assists in breaking down the phytates in the grain and allowing your body to be able to digest the nutrients and minerals in the whole grains. It is a very simple process. All’s you have to do is add at least 2 Tbls of kefir to whatever flour is called for in your recipe. For example, I am preparing rice for dinner. For one cup of brown rice, I add 2 1/4 cup fresh water and 2 Tbls of kefir. The recommended length of time for soaking rice is 7 hours. So it just takes a little thinking ahead! Once it is done soaking, I cook it as normal. Your body will now be able to assimilate the nutrition so much better! For our regular twice a week breakfast of oatmeal, I soak 1 cup of rolled oats with 1 cup of water and 2 Tbls of kefir (or more!). I let it sit covered overnight. In the morning I put 1 cup of water to boil on the stove. When it is rolling, I add the soaked oats and let it simmer for 15 minutes or so. We then add ground flax seeds, dried cranberries, chopped apples and sometimes a little mashed bananas and there you have an excellent high fiber breakfast. For quick breads that contain some sort of liquids (water or milk), replace up to half your liquids with kefir and soak the liquid, kefir and flour for 12-24 hours. That is the standard recommended soaking time for the best assimilation. For homemade bread, you soak the flour with the liquids, and kefir for the same amount of time. An excellent resource with more information on the benefits of soaking, and other resources, check out this site. The benefit of this 2 stage process is described in detail here. My favorite breakfast recipes are all soaked, including waffles, crepes, and pancakes. These recipes I have found from Sue Gregg cookbooks. I will share these recipes in upcoming posts. The benefits of soaking definitely out way any thinking ahead preparations. For any recipe that calls for buttermilk or yogurt, I replace it with kefir! Works perfectly every time. Do you have any other kefir ideas to share? Here is the start of ideas and resources for your purposeful holiday preparations (as I talked about here)! This is an excellent site for learning some thoughts on different meanings of Christmas traditions and symbols that are displayed around us. I learned alot as I read through this. Consider how you might incorporate more purpose into your holiday symbols by learning the history behind it all. Should we not put more thought into what the world sees in how we celebrate and decorate for the holidays? One idea would be to frame notes around each decoration with its symbolism and meaning. Bells both call us to worship (church bells) and remind us of the joyous angelic announcement of Christ’s birth to the lowly shepherds.The golden color of ones often seen is a Kingly one and reminds us of our Lord and Savior. More resources and ideas to come…. Monday is my designated laundry day! I have found it so much easier for me to get it all taken care of for the week if I get it completed on one day. This means I wash somewhere between 3-4 loads of laundry: whites, colors, darks, sheets, towels. Beforehand I was washing a load a day, but could never keep track what I had washed and when, and some days would get overlooked. This plan has been so much more effective for me, since I get it all done at once. UPDATE: I have come to realize…This method works great in the summer when I can hang my laundry outside to dry. In the winter, I have found more success doing my laundry on Monday and Tuesday and folding it on Wednesday. That gives ever load enough time to hang dry, since I don’t have enough space to hang everything on Monday. Frugal tip #1: Because I love to save a little electricity, and help out the environment, I also hang most of my laundry to dry. I laugh every time I hang my clothes from our lights in the hallway and fill up the bathroom with clothing lines, racks, etc. It is quite the day! Others think I am crazy…but hey, it’s worth it. When the weather is nice (this is limited to the summertime around here, but we have had some nice falls days up till now), everything gets hung out on my back deck. I enjoy being creative in saving money. Actually, since hanging my clothes to dry, our electric bill has gone down an average of $8-10 dollars a month. Now it may not be due to just hanging my clothes, but it seems to be the case. It doesn’t sound very much, but every little bit helps. It is also better for the clothes, they will last longer! The dryer definitely deteriorates everything more quickly. Frugal tip #2 as mentioned in a previous post: Speaking of washing clothes, try using a cooler cycle than what you are used to. Nine times out of ten your clothes aren’t so dirty that they absolutely require the hot wash, and you’ll save 30-60% of the energy consumed using the hot cycle. If you use the dryer, don’t over-dry your clothes, and consider using the cool-down cycle to utilize the residual heat in the dryer. Now my Monday laundry plan may not necessarily work for you…but having your own plan is the most important thing! This is one way we maintain our homes and serve our husbands and babies. No more hubby’s complaining about their lack of socks or tee-shirts! Tuesday morning is my ironing time (in the winter it is Friday). After everything is dry, I will iron my husband’s shirts and anything else that needs a pressing. Keep it simple! Whatever works for you…just don’t go without a plan of action for maintaining your home! How else can we effectively seek to serve and bless our husbands if we are not first on our knees interceding on their behalf? 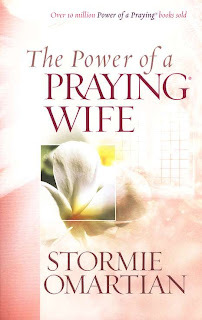 “The Power of A Praying Wife” by Stormie Omartian has completely changed my perspective on this important calling for us as wives. Throughout this book, Stormie gives 31 different focus prayer points to cover each day of the month. Such topics include praying for his: vision, health, protection against temptation, integrity, work, relationship with the Lord, role as husband, father, etc. For each topic she gives a detailed prayer to follow and verses to expand your prayers. 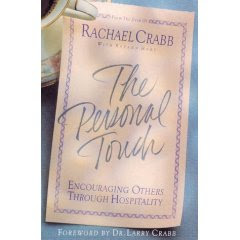 I am also planning on purchasing her prayer cards that are a companion to this book. They list the prayers out so you can post them around the house, or in your Bible, purse, car, etc. as reminders to lift your hubby up before the Lord. Since beginning the discipline of praying daily for my husband, I have seen the Lord work in some unique ways. One simple example was my burden for my husband to be able to pursue getting physical exercise on a regular basis, as I was concerned for his health. Now as Stormie emphasizes the goal is not to continually remind my husband of this desire and turn into a nagging contentious wife, but to first take this desire before the Lord in prayer. This is what I did and within a few days the desire was his. I was thanking the Lord! In other areas I have had to be a little more persistent, but God is doing amazing things in my husband’s life as a result. Prayer is effective in keeping my focus on laying my relationship with my husband before the Lord first and foremost, especially in the midst of conflict. I want my husband to be a mighty man of God! Where nagging doesn’t work…prayer is powerful! This is one of the best ways I can love and serve my family. Prayer is a powerful tool! Praise God for the ability to enter into His courts freely by His grace and lay our burdens at His feet. He hears our cries and answers them in His perfect timing. Blessings upon you as your pursue this high calling! Next Friday Blessing Corner: The importance of thank you notes! 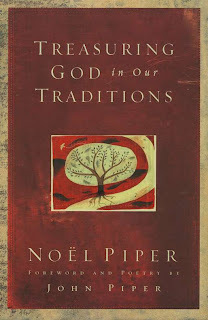 Treasuring God in our Traditions by Noel Piper is an excellent resource to refer to in planning and preparing for your holiday celebrations and not only that but also the meaning and purpose of it all. Why do we have traditions? Noel Piper believes that by our traditions we can help the next generation treasure God, and at the same time deepen our love for him. Only God can give our children a taste for his sweetness. He uses God-centered traditions and Bible-saturated family patterns and grace-laden heirlooms. She talks about the importance of having every-day traditions such as family devotions together, worshiping Christ together, praying together over your meals, etc. Secondly, she dives into the “especially” traditions, that of the birthdays, weddings, and planning of the holiday traditions. How will we seek to make Christ our treasure this holiday season? How will we strive to teach God’s word to the next generation through our traditions? How can we be purposeful during this busy and often overwhelming time of year? What are our children and the world around us seeing as the center most focus in our homes? Do others see why we celebrate? I have been dwelling frequently on the topic of contentment. Why is this such a great struggle for women? Young, old, single, married, we all battle this feeling of desiring something more. What does it mean to be quarrelsome? Contentious, argumentative, nagging spirit…What is the root? I was talking with my husband about this and his response was that the root cause of this contentious spirit is lack of contentment. A woman can so easily walk down this path when she lacks contentment. It all begins as she looses her thankfulness for the blessings that have been bestowed upon her. Instead of focusing on the blessings, she focuses on the negatives, her circumstances, the shortcomings of her husband or family, etc. One little thing upon the next, until finally her husband cannot stand dwelling with her. Instead of nagging her husband it would be so much more profitable to take it to the Lord in prayer. That way she leaves it in the Lord’s hands. Men can so easily loose their confidence with a nagging woman. We must exchange the spirit of contention with the spirit of thankfulness. “We give thanks to God always for all of you, making mention of you in our prayers; contantly bearing in mind your work of faith and labor of love and steadfastness of hope in our Lord Jesus Christ…” (1:2-3). There is always something to be thankful for! The other evening I was struggling greatly with some issues my little girl was having and my husband asked me, “what are you thankful for?” It was hard at first to switch gears but the sooner I did it and began making my list, the more joyful and happy I became. The heart of discouragement was replaced with joyful delight in the mercies of my Savior. 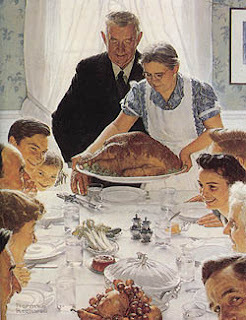 In light of this I decided to post on my bulletin board (see my previous post on this topic), “what am I thankful for today?” That way each and every day I can be reminded of the bountiful blessings that Christ has bestowed upon me. Pursuing thankfulness instead of discontentment for the glory of God!